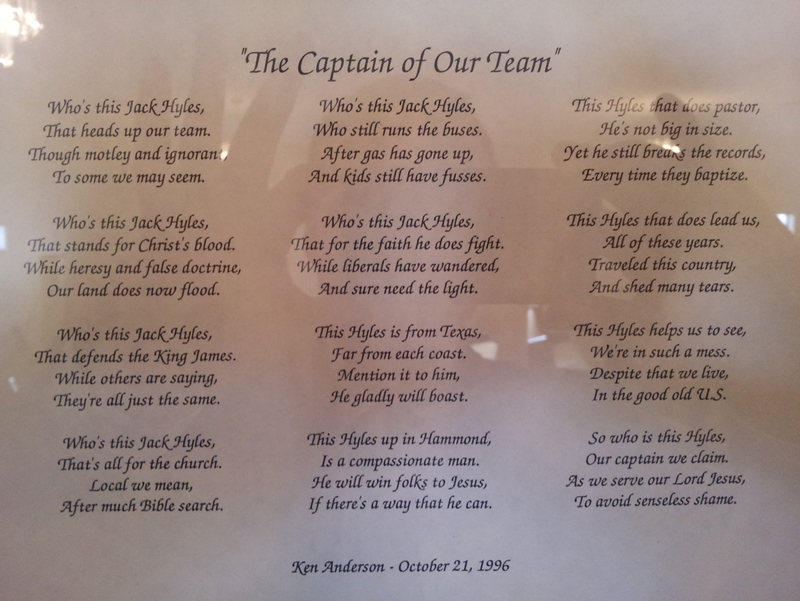 Today’s reader-submitted photo is a snapshot of a poem that a pastor wrote about his hero, Jack Hyles. I can’t see “heresy” without thinking of Warhammer 40k. Death to the heretic, in the name of the Emperor! The angels from Frank Peretti’s books are just like God’s Space Marines. Something similarly vomit-inducing was the book Hyles wrote about his wife after the scandal broke. It was aimed at showing everybody how much he really loved her, despite the fact that he had apparently not acknowledged her from the pulpit for years. Only Hyles would have the solid bass cojones to build or allow this sort of personality cult to exist in his church. Sorry, not a big fan of man-worship. Boy, after reading that poem (and I use that term loosely), it appears to me that pastor has a little more than a “man crush” on hyles.